Kalamazoo County school administrators and over 225 community members at nine organizations now better understand the impact of chronic trauma on children–and how we can respond more effectively to help trauma-affected children develop resilience. Making good on their promise at the ISAAC Public Meeting in October, school administrators participated in workshops in October and November. The WMU Children’s Trauma Assessment Center (CTAC) and key school staff explored how staff training and organizational approaches for trauma and resilience-building can help all children remain productively engaged in school. The Kalamazoo Public Schools have already held CTAC training for two staff groups. The United Way of the Battle Creek & Kalamazoo Region has granted funding to CTAC for training organizations serving children and youth, including schools. Momentum is building for trauma-informed practice in our schools and in our community to support our children! DVD & Discussion events continue with ten more organizations in the process of scheduling screenings of one or both Raising of America videos on trauma, Wounded Places and DNA is Not Destiny. A person with experience in the field of trauma provides additional insight and answers audience questions after the screening. Over 225 community members have participated in these awareness-building events thus far. Pictured here is our latest DVD & Discussion event hosted by WMU College of Education and Human Development and attended by 60 teachers, students, faculty and community members to learn more about trauma-sensitive educational approaches. They learned about an innovative alternative environment and staff development efforts already underway at Parchment Public Schools working with CTAC, and the School Connection Program at WMU with Dr. Luchara Wallace and several community partners. Interested in a screening and discussion on trauma and resilience at your congregation or organization? Don’t wait—send an email today to Task Force member Denise Hartsough, [email protected]. The Task Force will schedule screenings through May 2017. The next meeting of the Task Force will be Monday, December 19th from 5:30-7:00 PM at St. Luke’s. 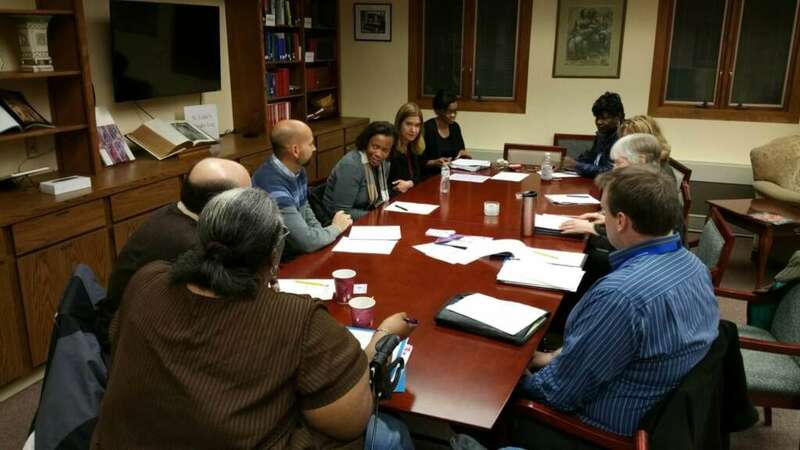 Our November Task Force meeting is pictured above. Please join us!